Doug Kirkbride and Golden Harvest Seed Advisor Vicky Shaffer discuss how different corn heterotic backgrounds influence ear types. Doug Kirkbride can point to the exact moment when he knew that agriculture would be his lifelong vocation. He was 11 years old, riding around rural Illinois in a pickup with his grandfather. It was harvest time, and the combines whirred with the promise of a successful growing season. As he drove, Kirkbride's grandfather, who farmed for a living, spoke passionately of the responsibility that comes with taking care of the land. He talked about how the entire process starts with a seed and how much attention is required to help it on its journey. Kirkbride’s roots in agriculture run more than a century deep. His father farms about 1,000 acres of corn and soybeans. The original family homestead is an Illinois Centennial Farm. As a kid, Kirkbride helped out with the family business. He raised a small herd of Simmental cattle and participated in FFA shows. After graduating from college, Kirkbride, who had a growing family of his own, decided to move away from the family farm. Kirkbride started in ag retail, selling seed and chemicals. It was about this time that he made a discovery that would change the arc of his career. “Working in retail is where I discovered my passion for agronomy,” he says. 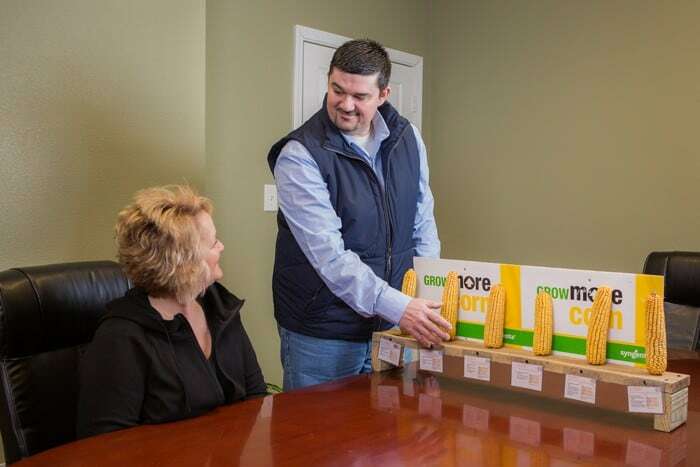 As growers brought him their challenges, Kirkbride found that he was inspired to help. He went back to school and earned a master’s degree in agronomy. He then joined Syngenta in 2005. Agronomist’s passion and #ag knowledge help growers and retailers tackle seasonal challenges. As product development agronomy manager, Kirkbride wears a number of hats. He provides technical expertise to members of the sales teams at Syngenta, keeping them up to speed on the latest advances in agronomy. He does the same with retailers, and teams with growers to tackle their challenges. Kirkbride leads a team of seven agronomists, who handle the territory east of the Mississippi River. It’s a big territory, with a wide variety of soils and a different set of challenges that come with each one. He helps oversee a number of research sites—including a small site in Pana—where the latest Syngenta seeds and chemicals are field-tested. These outdoor classrooms allow Syngenta reps and growers to team together to determine which approaches work best for which soils, management practices and weather patterns. It’s an ongoing process.